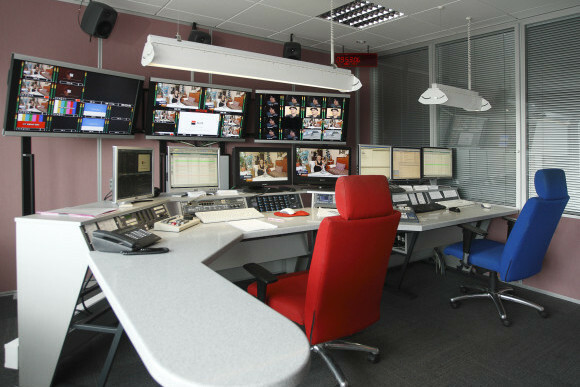 In a major initiative to improve and expand its playout operation, Czech TV sought to implement a new master control room (MCR). The aim was to enable transmission of its four terrestrial television channels across multiple distribution networks. As with any MCR and playout system absolute reliability was essential. In addition, Czech TV demanded total interoperability and inter-changeability. The broadcaster needed to be able to control any TV channel to any output, from any MCR suite. Technical solution was designed for maximum flexibility and includes following main principles. • A highly redundant and universal master control room system applying the N+1 principle, easily extendable to other distribution channels in the future. • Fully flexible configuration enabling easy grouping of MCRs and switching of control between them. • Remote administration and diagnostics. • Providing leading design, systems integration of legacy and new technology, project management and technical support, our team delivered this complex project, the first of its kind in the Czech Republic, on time and within expected budget. The Aveco Astra automated control system sits at the centre of the whole solution. Master control rooms are equipped with Harris IconMaster master control systems – consisting of independent mix/effect unit, external matrix and control panels. Input processing consists of four SDI frame-synchronizers with Harris SDI distribution amplifiers. Harris Platinum matrixes are used to enable SDI, HD-SDI, AES-EBU and analog inputs and outputs up to 512×512 configuration (output matrix up to 256×256). Video signals are monitored by Evertz multiviewers. Each room is equipped with two modules with three 40“ LCD multiscreens displaying up to 24 signals, from both the input and output matrix and backup outgoing routes. Content is recorded to Teracue‘s DVB- ASI module and ICUE streaming server, which ensure storage of the whole DVB-T packet including EPG, PID tables and individual channels to the archive server for a period of 1 month. Omneon servers are configured for main and backup playout for all master control rooms. Working in close collaboration with our team, Czech TV was supported by a systems integrator with over 20 years experience in designing and delivering quality broadcast solutions.